Today we released Orbeon Forms 2018.2.2 PE. This update to Orbeon Forms 2018.2.1 PE contains bug-fixes and is recommended for all Orbeon Forms 2018.2 PE and Orbeon Forms 2018.2.1 PE users. Orbeon Forms 2018.2 features new Date and Time form controls. The reason the controls are new is that we wanted to modernize the date picker on one hand, and add new features such as the ability to exclude certain dates from the date picker on the other hand. This would have been very hard to do with the older controls which had a lot of history behind them. 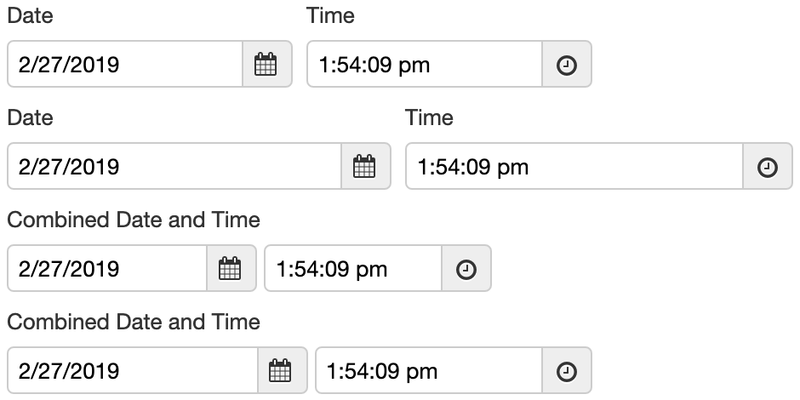 So we created a brand new Date control, and we used the opportunity to improve the Time control as well. The new controls are implemented as XBL components, which means they are more modular and easier to maintain. 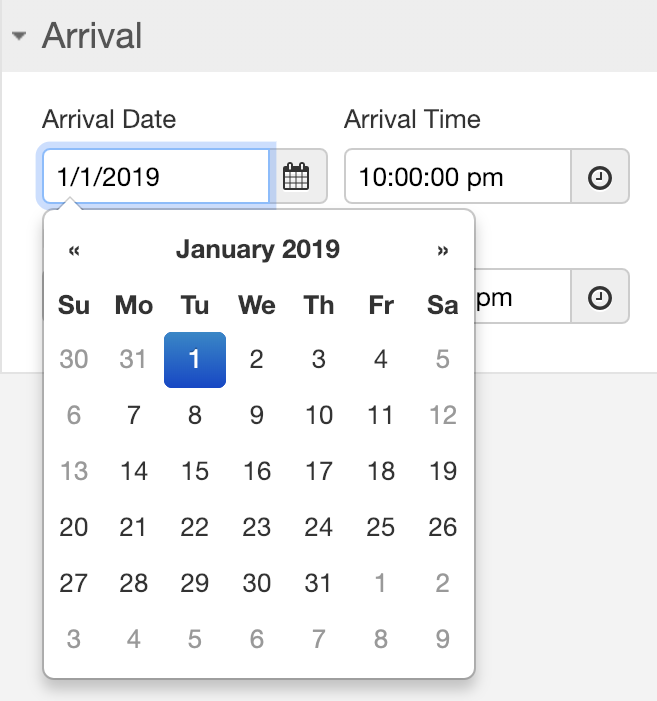 Here is the new date picker with the January 5, 6, 12 and 13 dates unavailable (grayed out) using The "Dates to Exclude" constraint. In addition, the controls have an option to take their "natural" (usually more narrow) width or, which is new, to fill a grid cell entirely to facilitate alignment. 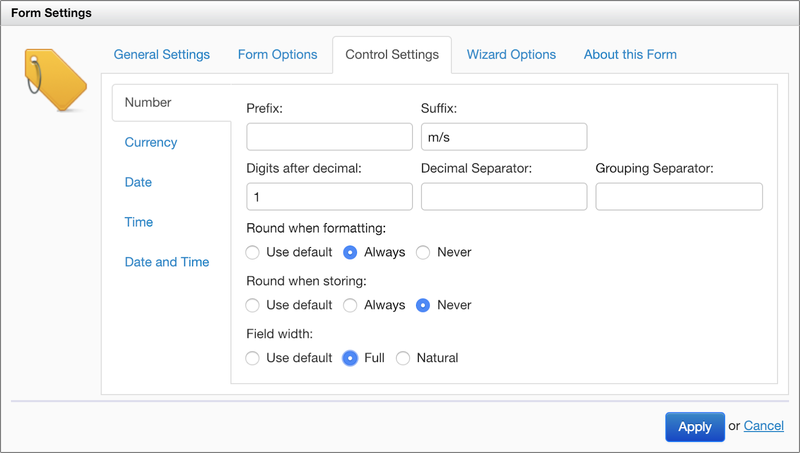 You control whether a field takes its "natural" width or the full cell width from the "Control Settings" dialog, or globally for the form in the "Form Settings" dialog. Here is another example showing different control widths, adjusting automatically to grid cell widths. For backward compatibility, only forms created with Orbeon Forms 2018.2 default to having full width Date and Time controls, while forms created before that version default to the "natural" width. This can be changed in the control or form settings, or globally via a configuration property. The legacy Date and Time controls remain available for the time being for backward compatibility scenarios, but new forms created with Form Builder, as well as existing forms loaded and republished from Form Builder, will automatically use the new controls. We hope you will like these enhancements of Orbeon Forms 2018.2! Orbeon Forms 2018.2 introduce a new form control in the toolbox called Hidden Field. Holding intermediary calculations: If the control has a "Calculated Value" and/or "Initial Value" formula, it can be referred to by variable name (like $my-intermediary-result) from other formulas. Handling out-of-band validations: If the control has a label, alert and validations, a failing validation will show in the Error Summary. In addition, this also impacts the Wizard View's lax and strict validation modes, preventing forward navigation until the error is fixed by the user. It has always been possible, with Form Builder, to hide any field by setting its visibility using the false() formula, or, with Orbeon Forms 2018.2, by selecting the option "No". But hiding a field this way can have unintended consequences. In particular, the control becomes in effect non-existent in the user interface when it comes to value change events which are useful in actions, and valid/invalid events which are used for validation. So even if the value of a non-visible control is invalid, the form is considered valid. As a workaround, you can place a CSS class to hide a Calculated Value control to the user. The drawback of this is that the value of the control is still visible in the browser using "View Source" or development tools so this workaround cannot be used for sensitive data which the user should never see. The new Hidden Field control, on the other hand, works like a regular control such as a Text Field in all respects, including events, validation, and alerts. Except, of course, that it doesn't show to the user at runtime. In particular, its value is guaranteed to stay on the server. 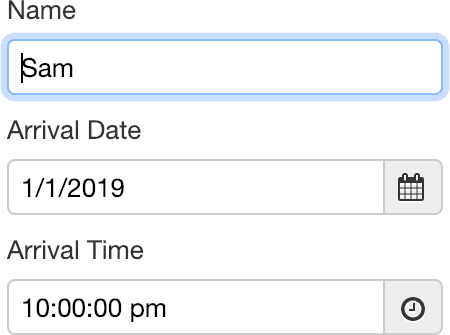 At design-time, in Form Builder, the control shows as a box with an icon so that the form author knows that a hidden control is in use. You can move that control and modify its properties like with any other form control. See also the documentation for details. We hope you will like this feature of Orbeon Forms 2018.2. Today, following the release of Orbeon Forms 2018.2.1 PE, we also released Orbeon Forms 2018.2.1 CE which addresses some regressions and important issues. This update to Orbeon Forms 2018.2 CE is recommended for all Orbeon Forms 2018.2 CE users. Today we released Orbeon Forms 2018.2.1 PE. This update to Orbeon Forms 2018.2 PE contains bug-fixes and is recommended for all Orbeon Forms 2018.2 PE users. We regularly observe usage patterns reported by Orbeon Forms users. One pattern that comes frequently is support for what is traditionally called a master-detail view. For example, you first enter a list of initial information (the master), as shown in the following screenshot. Later in the form, for example in a subsequent wizard page, you complete the information (the detail) for each item of the list. Doing this until Orbeon Forms 2018.2 required writing very complex custom XForms code in the form, which usually required talking to the Orbeon support team. This is explained by the number of cases to handle: adding, removing, moving, iterations in the master grid, and also synchronizing values from the master grid to the detail view. Further, such custom code is hard to maintain and could break with new Orbeon Forms releases. So with Orbeon Forms 2018.2, we are introducing a new synchronization component which does all of this declaratively and reliably. The component is maintained by Orbeon in new Orbeon Forms releases so you have peace of mind when upgrading. We plan to add a user interface for this feature soon. In the meanwhile, it is easy to set this up by opening the Edit Source dialog and configuring the synchronization. For more, see the documentation. 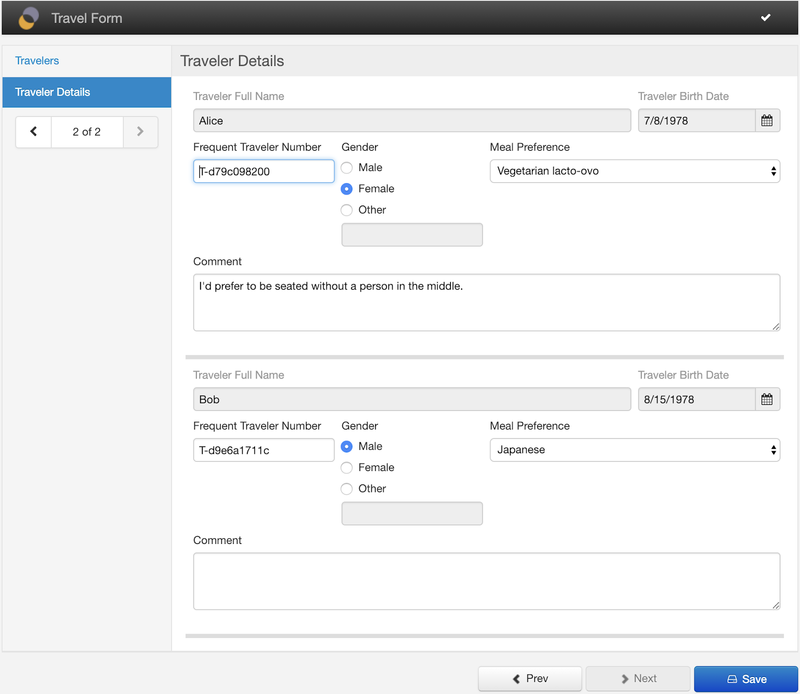 We hope you will like this new Orbeon Forms 2018.2 feature!